As I braced myself for the 45 minute bus ride from SE Portland to St. John’s, I couldn’t help but think about my time in San Francisco only one year ago, a city that is characterized by hills and electric buses which sometimes appear to be climbing those hills at impossible angles. A couple weeks ago, I chatted with my friend Aerica, a face I haven’t seen in over a year. She reminded me of our last visit in February 2011. One year and five months ago. My memory of climbing Coit Tower with her and meandering through the silly tourism of Fisherman’s Wharf is vague and blurry, a happy sun-lit visit that seems like another life time, let alone just a little over a year ago. It’s funny how time can become skewed- a span of months can blur into a blob of days, emails sitting unread for months seem like they just arrived in my Inbox. My arrival back in Portland one year ago can seem like just yesterday, but the day I left San Francisco one year ago can also seem like a past life. 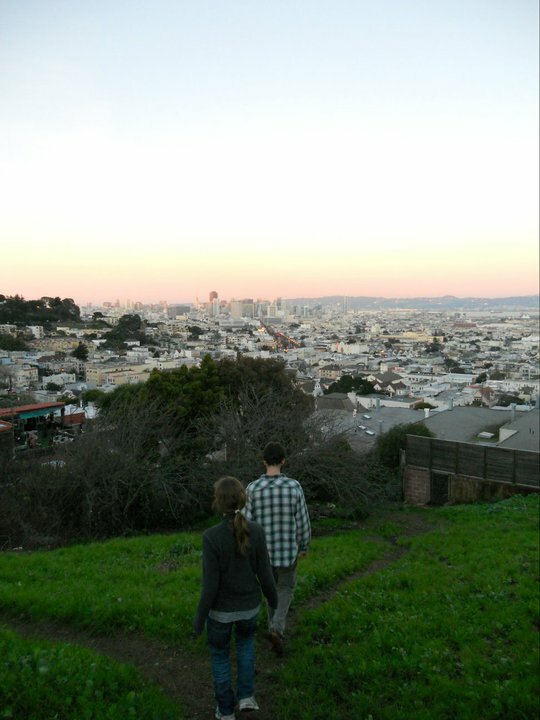 The nine months I spent living, exploring, and writing in San Francisco were happy and freeing, a chance to explore a new city, take on exciting volunteer roles, and work wherever I could. One of my paid jobs was a once-a-week nannying job where I provided care to a growing 2-month-old, who over the time I knew him, changed into a babbling, toddling 9-month-old. To reach their house, which was located inside Fort Mason in the farthest North neighborhood of San Francisco (the Marina district), I took the #49 bus, which I rode for 45 minutes. I would travel all the way down Mission Street, and then down Van Ness, getting off at the end of the line at North Point. Much of my urban exploration of San Francisco was done by bus, most travels beginning with my local bus, the 24. Though I could reach my favorites spots like Bernal Hill, Billy Goat Natural Area, and Glen Park Canyon by foot and traversed exhilarating stairways in the process, the prime reason why I was able to capture the city in my hands and traverse its geography with ease was the ease of the MUNI system. My understanding of it grew quite a bit over the nine months I spent in the city, as its snaking, intersecting web of buses and light rail became a map in my mind. As my map of the city began to develop, landmarks and transit lines became like old friends to me. When my human friends would come to visit, I was always excited to traverse 12 miles of the city by foot with them, arriving home on MUNI, or transferring buses at the drop of the hat, only to divert our course off onto a different direction. I came to know where each number or colored line went, where the stops were, and where they intersected with other lines. Though San Francisco isn’t large (only 7×7 miles square, something described as a peninsula, or by Rebecca Solnit as a treasure island), it has an incredibly large and impressive transit system that a city of such caliber should have. It has been my resolution to embrace my city in its fullest recently. Find myself in new places with much to be explored. So when a friend asked me to meet her in St. John’s to go on a hike of Forest Park with her, I couldn’t say no. It was a quiet, cool, dripping Sunday morning. My roommate, the morning person, was sleeping in. But I had an adventure in front of me, one that involved taking the bus to the forest. Preparing for my bus ride, I was struck by how similar the process was to my cross-city commute in San Francisco: a 10 minute bike and 45 minute bus ride. As I left the house, I was struck by the quiet. The remnants of rain were still dripping from the trees, the air smelled like wet earth but was certainly not dried out by any inkling of sun. Laurelhurst Park hadn’t quite woken up yet, but some morning dog walkers and early risers were walking the paths darkened by overhanging trees, the grass of the dog park soggy with wetness. As I reached the bus stop, my body thrummed with excitement. This ride was nothing like the weekly commute to my San Francisco nanny gig, though that did include pleasant stroller walks through Fort Mason. This Sunday morning excursion’s only purpose was to meet a friend in St. John’s and drive just across the river to the unique urban wilderness of Forest Park. Though I plan on writing more extensively in the future about Portland’s gem of a forest, the fact that it is the largest urban wooded area in the country and a 5,000 acre gateway to the Tillamook Forest and the Coast Range to the West cannot go unsaid now. 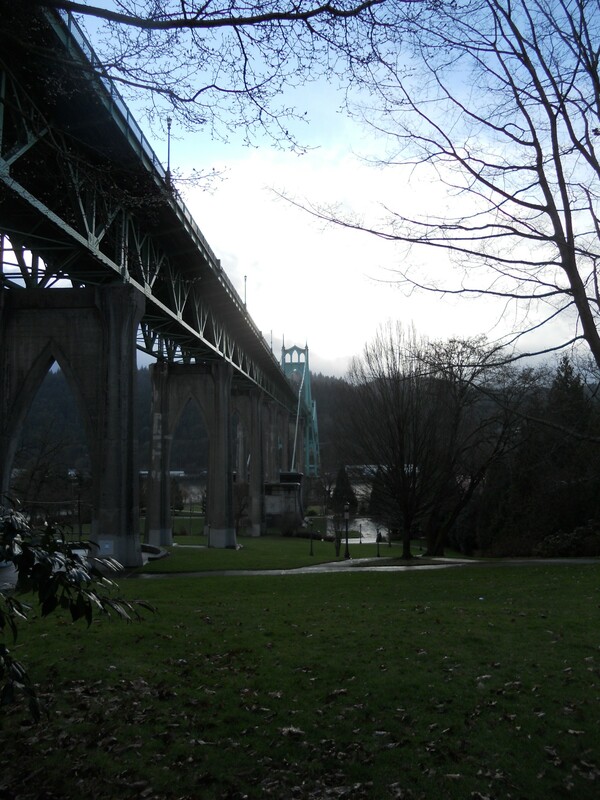 Teeming with wildlife and botanical diversity, Forest Park is quite the feature to have in your city, an expanse of pure dark green overlooking Portland and the river. After a bus ride through the North side of Portland- through the tree-lined, large-housed Alameda neighborhood, past artsy Alberta, Prescott, and Killingsworth, past the campus of Concordia University, to the highway of Columbia Blvd where I know the waterways of Whitaker Ponds nearby houses peaceful herons and beavers, we finally arrived on Lombard Street, where we then headed West past 1-5, cell phone stores, and tacquerias, where I hopped off at my final destination of the St. John’s neighborhood. This part of Portland is similar to Bernal Heights, in that it always seems like a step back in time, a small town placed within a big city, a small, sleepy, community-oriented place where neighbors know each other and call “hello!” to each other at the local coffee shop. I met Shawna at Anna Bananna’s, a funky local establishment that sells coffee and local zines, where we talked over hot drinks before heading out into the morning. We crossed the St. John’s bridge together, the magnitude of Forest Park looming before us, verdant and dripping with green. Marcy Houle’s One City’s Wilderness in hand, we parked just off Germantown Road and just like that, we disappeared among the trees, onto the trail. Up and down, back and forth on fire lanes and marked trails, we walked beneath maples and alders and beside Douglas Firs, letting our hands run along their thick bark as we passed. Down to Highway 30, through the Linnton neighborhood, then up again into the park, letting Linnton Creek carry us up the hill with its gentle babbling song. We conversed, letting our words follow our feet forward and up, our breath coming fast, then slow as we came to a rise in the trail. Our legs strained, enjoying the sharp incline, and our noses were filled with the deep aliveness of a fresh wet rain, so recent. Our feet squelched in the mud, dirtying our trusty hiking boots. And our ears were delighted by the Pacific Wren’s joyful tinkling song. Mozart would have been proud. Next week, I begin a new adventure. My trusty colleague, Elvira, and I will be leading a group of 10-13 year old hikers through the wilderness of Forest Park through Portland Parks and Recreation’s Summer Nature Day Camp. 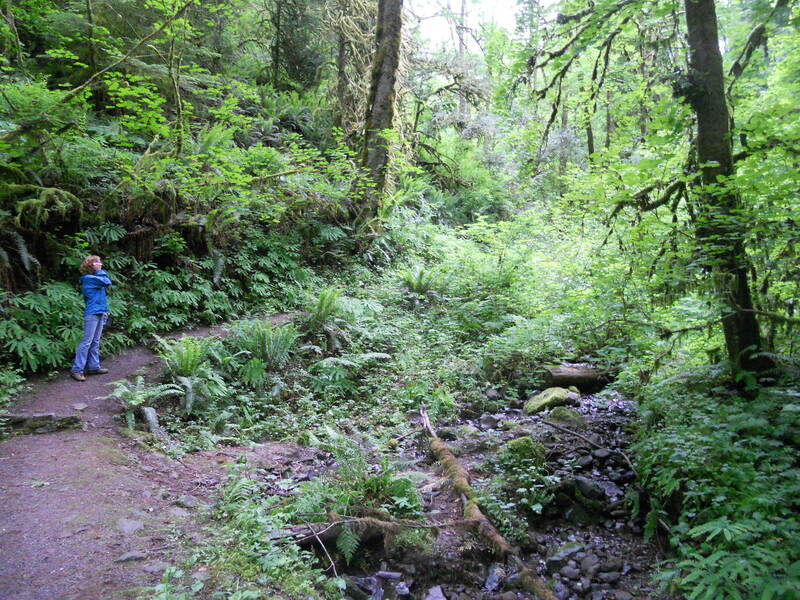 Our feet will walk along every mile of the 30-mile Wildwood Trail, a true Portland gem. And we’ll carry with us Colin Meloy and Carson Ellis’s Wildwood, to aide us in our imaginative journey through the forest. Stay tuned for future updates on this trip and more Forest Park adventures I will take, but in the meantime, I invite you to hit the trail! Tags: forest park, infinite city, Nature, Portland, San Francisco, trails, transit. Bookmark the permalink. Look forward to hearing about your adventures. Urban exploring has a special place to learn about nature in the most unlikely places.